It’s January which means a lot of you will be determined to make a positive change to your body, health or lifestyle. 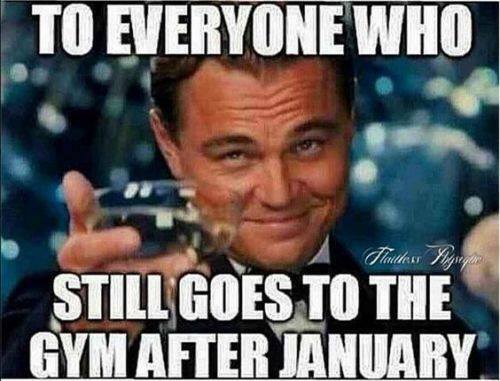 New Year gym goers get a bad rep and it’s no surprise really. Every year they go on and on driving everyone mad telling what their going to do but then quit two weeks in. Everyone has had enough of hearing it year in year out. This isn’t necessarily the fault of these people though. The fitness community isn’t a very welcoming one and quite frankly most fitness ‘professionals’ are more interested in making quick cash at this time of year than actually helping anyone. With this in mind here are my top tips to actually achieving your goals this year. Number one. Chill out; if you probably haven’t trained for a long time and you’ve also slowly gained weight over that time then you aren’t going to lose it overnight. Everyone seems to go mad trying following a regime that would put most pro athletes to shame. It’s too much, know your limits and focus on making small sustainable changes rather than going all out. Number two. Be patient stop thinking in days and weeks and start thinking in months and years. Trying to achieve your goals quickly will inevitably lead to failure aim to work towards a realistic goal throughout the year and you’re a lot more likely to achieve it. Number three. Make sure you enjoy what you are doing. I believe there is a form of activity out there for everyone that they will actually enjoy and that’s a huge step in the right direction. If you enjoy doing it you’re far more likely to do it anything you hate doing has a shelf life it’s not sustainable. Number three. Stop being overly restrictive. Just like doing something you hate, eating stuff you hate isn’t sustainable. The vast majority of people don’t need to massively overhaul their whole diet they just need to make a few small changes. Going overboard will likely leave you feeling tired, hungry and you’ll end up binging and quitting. Number 4. Stop telling everyone about the new you. This serves no purpose other than to bore the people around you and make you look stupid when you stop. Focus instead on quietly cracking on towards your goals and you’ll probably find people are a lot more supportive towards you than they are when you ram it down their throat. Number 5. Don’t stop at the end of January! Come on nobody wants to be that stereotype. If it’s important enough for you to start in the first place then it’s important enough for you to keep going. It takes about six month to build a habit if you stop after four weeks you haven’t even got started. I hope some of this advice is helpful going forward and I also hope that anyone embarking on a fitness kick this January is more than successful in achieving what they set out too whoever they are and however they are training. → You are being exploited!